This unique formula combines three natural sleep supporters, melatonin, 5-HTP, and L-theanine, in one delicious chewable tablet. This non-habit forming blend is ideal for anyone who has trouble falling asleep and staying asleep. Enjoy a restful sleep and maintain a healthy sleep cycle so you wake up refreshed. Free of artificial colours, preservatives or sweeteners; no dairy, wheat, gluten, yeast, soy, egg, fish, shellfish, animal products, salt, tree nuts or GMOs. Suitable for vegetarians/vegans. Canadian brand. Recommended dosage (adults only): At bedtime only, chew 2 tablets daily with food or as directed by a physician. Consult a physician for use beyond 4 weeks. Consult a physician if symptoms persist continuously for more than 4 weeks (chronic insomnia) or worsen. Consult a physician prior to use if you are taking carbidopa or drugs/supplements with serotonergic activity. These may include, but are not limited to, L-tryptophan, S-adenosylmethionine (SAMe), St. John’s wort, antidepressants, pain killers, over-the-counter cough and/or cold medications containing dextromethorphan, anti-nausea and anti-migraine medications. Consult a physician prior to use if you have a hormonal disorder, diabetes, liver or kidney disease, cerebral palsy, seizure disorders, migraine, depression and/or hypertension, or if you are taking blood pressure or sedative/hypnotic medications. Discontinue use and consult a physician if you show signs of weakness, oral ulcers or abdominal pain accompanied by severe muscle pain, or if you experience skin changes. Do not use if you have scleroderma. Do not drive or use machinery for 5 hours after taking melatonin. Do not use if you are pregnant or breastfeeding. Do not use if you are taking immunosuppressive drugs. Some people may experience drowsiness. Exercise caution if operating heavy machinery, driving a motor vehicle or involved in activities requiring mental alertness. Some people may experience diarrhea, nausea, vomiting and abdominal pain. Keep out of reach of children. 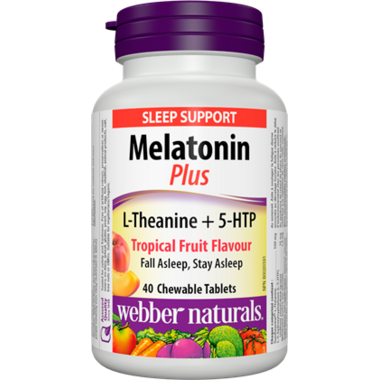 I have been using the Webers Melatonin Plus for about 2 years now. I swear by them to help get to sleep quickly. I also use the Regular Melatonin 5mg and 3mg to stay alseep thru the night.